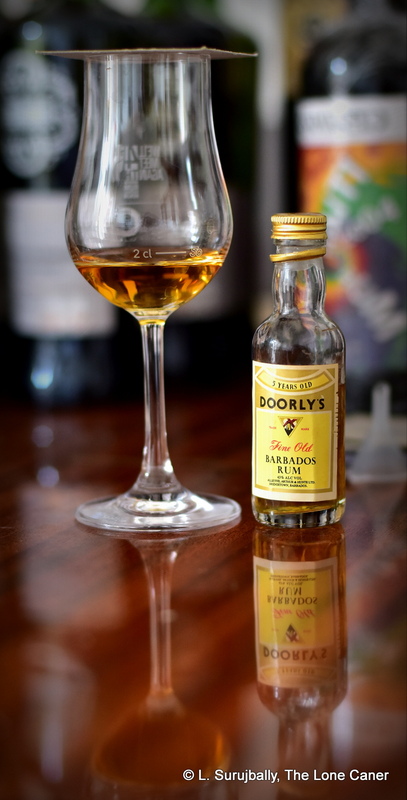 Here’s a Doorly’s five year old rum that predates their acquisition by Foursquare in 1992. 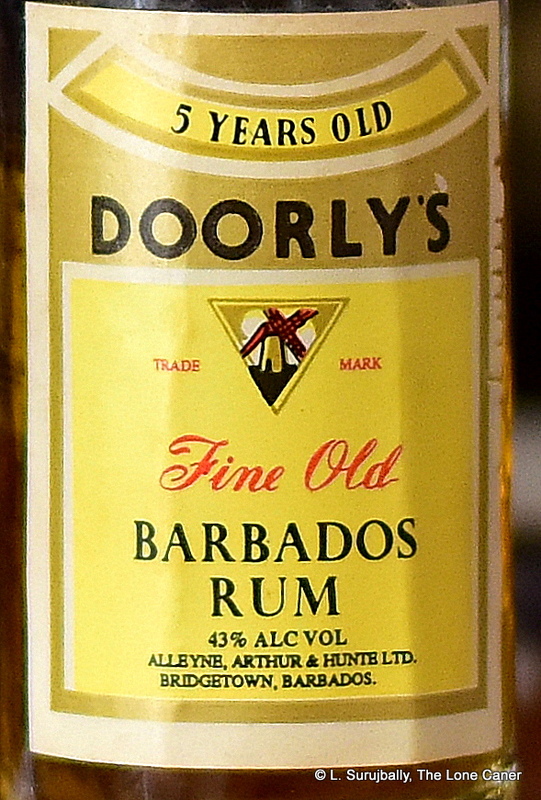 Note the Alleyne, Arthur & Hunte script at the bottom – they were also a merchant bottler in Barbados (they made the original Old Brigand and the Special Barbados Rum), who acquired Doorly’s in the 1970s and were themselves taken over by Foursquare in 1993. So the best we can date this specific Doorly’s rum is within that period (I’ll place it in the 1980s). The fascination is, of course, in how the product from back then compares against the Doorly’s 5YO made by Foursquare now, though unfortunately I’ve not tried the current iteration, so I’ll have to wait until I pick one up. Nose – Warm and fruity, fairly similar in general terms to other Doorlys’ from modern times, or even the Real McCoy, though I think it may be a smidgen better – perhaps because its more straightforward, more simple, and doesn’t try for serious complexity. Notes of peaches meld nicely with cherries, dates, molasses and flambeed bananas. Palate – Intensity and clarity gets dialled down a notch, though it’s still quite flavourful, and dry. Sugar water and white fruits, pears, watermelon. Cherries and peaches become evident after a while, with some saltiness (not much). There’s a nice hint of strawberries and unsweetened yoghurt in the background. Finish – Short, dry, lightly fruity and creamy, with a dusting of crushed almonds thrown in. Thoughts – I tried it alongside the Doorly’s XO and 12 Year Old, and it held up really well against those two. Maybe it was made in simpler times, with less experimentation of the plates on the stills, less blending of pot and column distillate, I don’t know. It just presented as a straightforward rum in whose simplicity lay its strength. I liked it a lot. The more of these short-form rum retrospectives I write and the further back in history I go the more my sense of frustration grows. While it is certainly easier to do one’s research on current rums and companies than it must have been for the earlier book writers like David Broom or Ed Hamilton, what makes me despair is how much has already been lost. To name two off the top of my head, just try researching Dethleffson or Sangster-Baird in depth and see how far that gets you. If nobody is on record as documenting (for example) when the Banks DIH 10 year old first appeared, or when this Doorly’s came out, or background notes on the Three Daggers Jamaican rums, then all we are left with is the labels on Peter’s site in the Czech Republic, the bottles in private collectors’ warehouses, these few write-ups….and nothing else. My friends and colleagues in the rum world take a lot of time and care documenting distillery visits, estate histories, the development of rums in whole countries…but not many ever get into the granularity of the history of an individual rum or its brand. As a lover of both rum and history, all I can say is that leaves us all poorer, and perhaps it’s time for producers, distillers, amateur and professional writers, to start taking this undervalued niche of the rumiverse more seriously and making it available outside of company archives (assuming those exist). Knowing who Foursquare and Doorly’s and Alleyne, Arthur & Hunte are and how they came together is one thing. Knowing which rums they made and when they were issued, is quite another. And my personal opinion is that we need such details to be available publicly — because let’s face it, we can’t always be running to Richard every time we have a question on a Bajan rum.